Scandal gives you a little taste of what you can expect to hear on the night alongside Max G and Jamo Beats. From Fetty Wap to Soul 4 Real Take a listen and come down on the night! 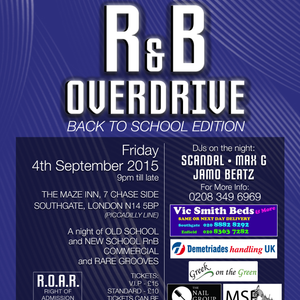 On Friday the 4th September, Crackers Radio are hosting RnB Overdrive – Back To School Edition. Join us at the Maze Inn bar in Southgate for a night of pure OLD and NEW school RnB with Crackers&apos; very own DJs Scandal, Max G and Jamo-Beatz. They’ll be mixing up all the RnB hits you love, for a night of non-stop musical entertainment.